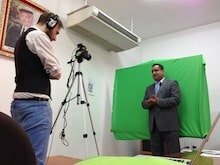 During the second on-site E-teacher training week in Jordan, Irbid University professors prepared E-teaching materials for their own classes. By using new technologies they aim to motivate and activate their students. In small work teams and short cycles, the trainees elaborated lesson plans and produced actual course products such as videos and various presentations. By moving part of the lecture content out of the classroom, there is more time for group work and one-on-one coaching during the lectures. In the coming weeks the training participants will be implementing their first E-lessons and share their experiences within the group. Together they now form the group of E-teaching pioneers that will continue to collaborate and expand the E-teaching Community of Practice Irbid National University.